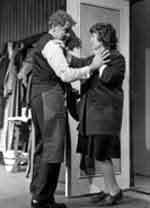 Don't drink the Water "Newcomer Dorothy Blakey handled her first major role with accuracy and command." " . . a gem of a French maid from Dorothy Blakey of Burlington." Robin Hood "The rest of the cast . 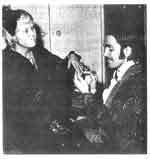 . . were overshadowed by Dorothy Blakey as the shrewish nagging wife of the Sheriff." ". 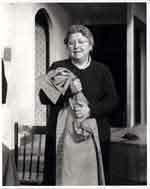 . . . . it is Dorothy Lees-Blakey's Madame Arcati who steals the show. A talented actress (she appears by special permission of Canadian Actors' Equity), Ms Lees-Blakey portrays Madame Arcati as fervent, jaunty, bossy and just on the shy side of certifiably insane. 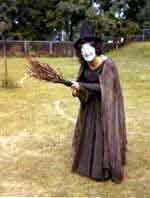 With her outlandish get-ups and her headmistress-style platitudes, this foolish medium is a most unlikely link to the supernatural , but a guaranteed link to laughs for the audience." 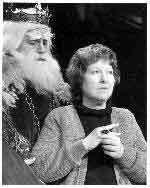 "Dorothy Lees-Blakey's portrayal as Orgon's mother Madame Pernelle was a delicious cameo and the gem of the entire evening." "A fine imperious performance by Dorothy Blakey . 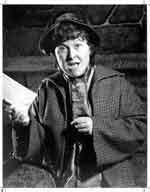 . ."
"Dorothy Lees-Blakey, who composed the haunting theme music, plays the role of the stage manager. Subtle undercurrents of tension and lack of sympathy to Sir's breakdown shown in her portrayal, leave us stunned by her depth of feeling in the last scene."